Specializing in intimate, customized one one one and group classes. Gentle: a variety of standing, balance, leg and core strengthening, along with some stretching towards the end of the practice. Yin: a cooling practice where most poses are taken while sitting or lying down. Poses are held for longer periods of time in order to influence the body’s connective tissue. Mindful Strength & Stretch: a variety of simple, dynamic movements to enhance the body’s ability to perform every day tasks (e.g., work on hip flexors, hamstrings, spinal movements). Will also incorporate balance poses, as well as several longer-held seated and reclined stretches. All classes will periodically included pranayama (breathing exercises), as well as brief guided and silent meditation practices. Specializing in intimate, customized group classes. See schedule and pricing above. Also known as Yogic Sleep, yoga nidra is an opportunity for the body to truly relax. Jennie will lead you through a short guided meditation where all you have to do is relax and breathe. Potential benefits include reduced stress, reduced anxiety, improved sleep quality, and enhanced mental focus. Held on the first Sunday of the month (following Yin) and on the first Tuesday of the month (following Gentle Flow); lasts 20-25 minutes. Free to those with a current class pass! Without a pass, $10. Contact Jennie at breathewithjennie@gmail.com to schedule your session soon! Would you like to bring some breath and movement to the office? 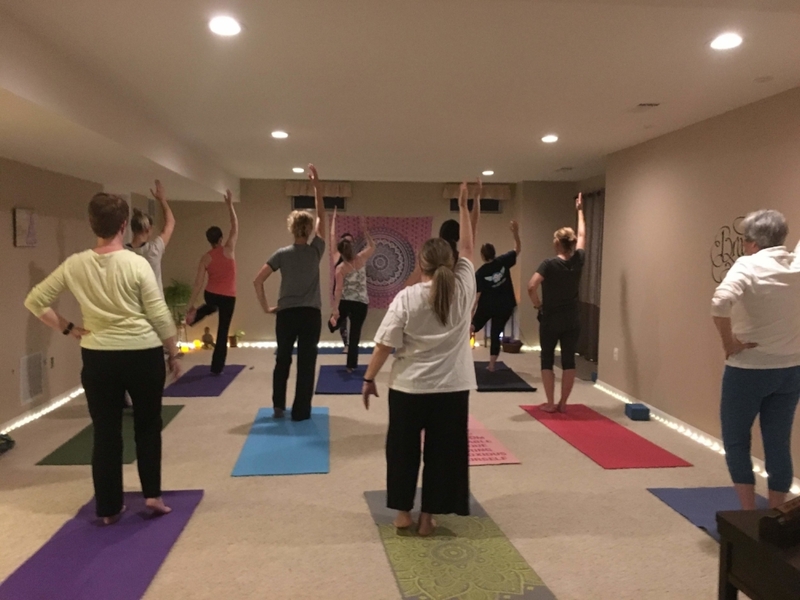 I have been leading corporate yoga classes since August 2017. Classes are customized to the employees' needs. I have extra yoga mats and props. Can be held in the morning, during lunch, or before folks head home from work. Contact me at breathewithjennie@gmail.com for more information and pricing. Including yoga for Girl Scouts and other special events for ages 10 and up. Contact me at breathewithjennie@gmail.com for pricing and availability.